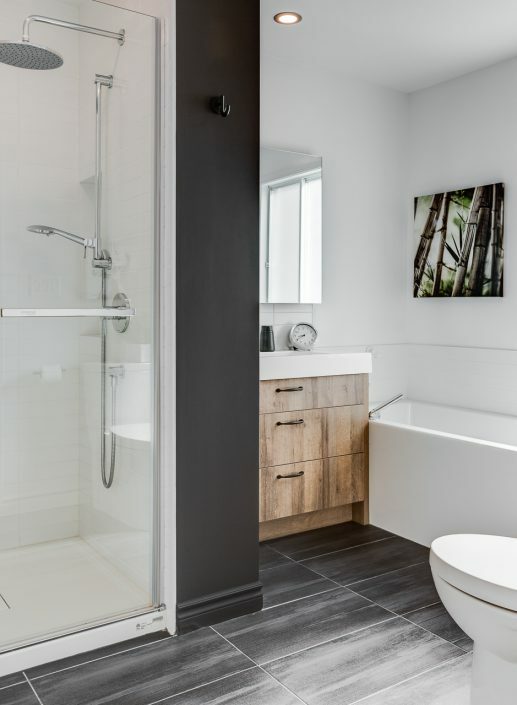 Check out this refined and zen-style bathroom renovation project in a Longueuil residence. You too can benefit from our general renovation contractor’s expertise and our turnkey bathroom renovation service. Call us for a free consultation! 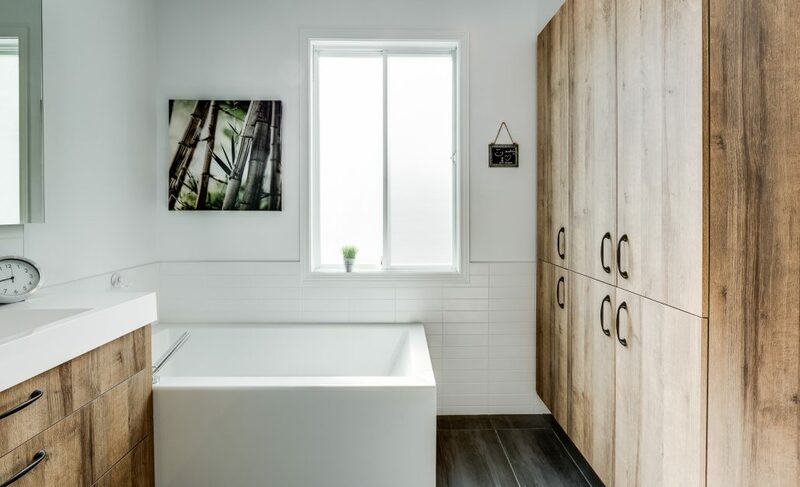 For this particular bathroom renovation project, the first limitation was the size of the room. However, we were able to rely on the creativity of our client and our team of designers to create a bathroom space that is both functional and elegant, with maximum brightness. We first played the contrast card with white walls and a charcoal grey wall, with a black and grey ceramic floor covering. For a touch of naturalness, our client opted for a custom vanity with wooden drawers and ceramic countertops. 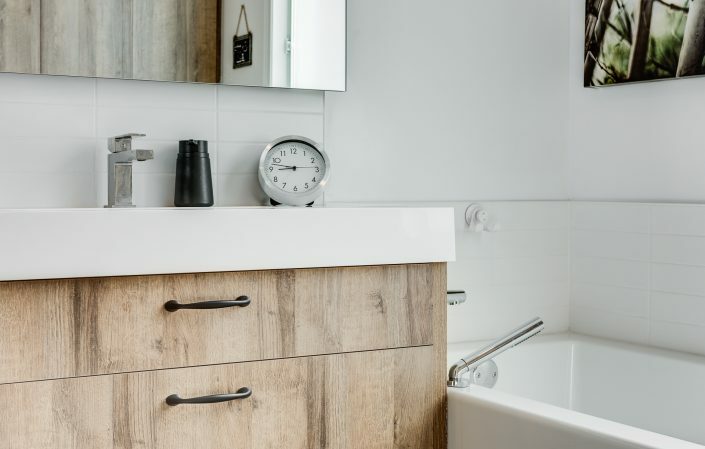 This vanity is surmounted by two mirrors placed in such a way as to form a corner. We have also added custom wooden bathroom cabinets in the barn wood style for maximum storage. We separated the shower from the vanity with a piece of wall. 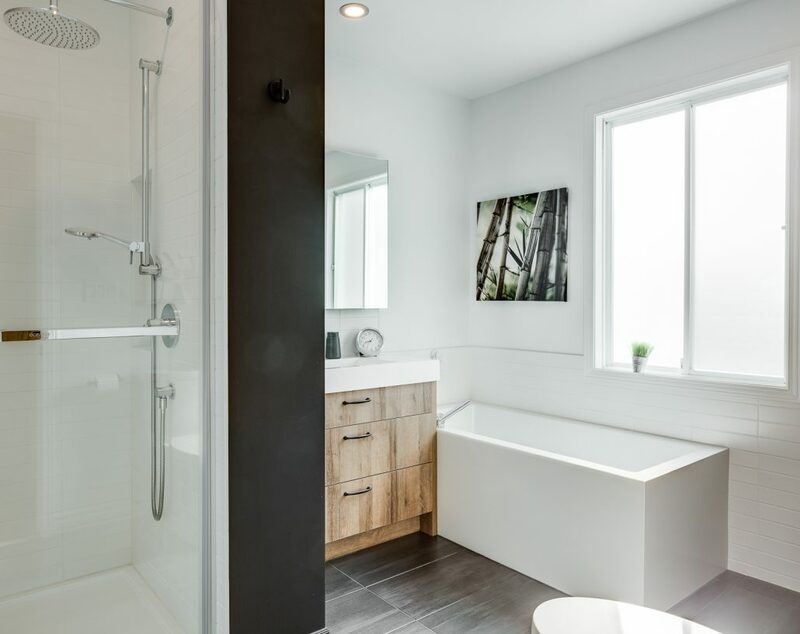 The shower is a classic recessed shower with telephone shower and rain shower head, with white ceramic wall. Considering the space limitations, we had to add a custom-made built-in bathtub with a chrome finish faucet and hand shower. 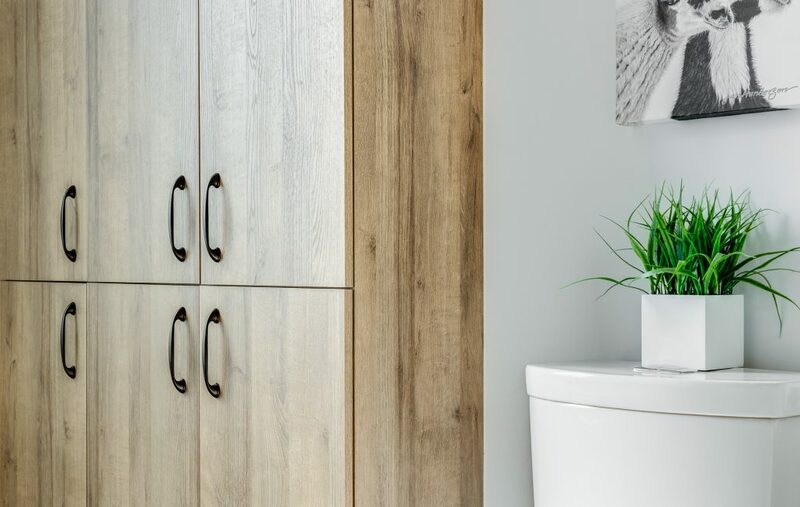 Accessories, such as the plant and frame, added a touch of color and created a Zen atmosphere for this small bathroom. 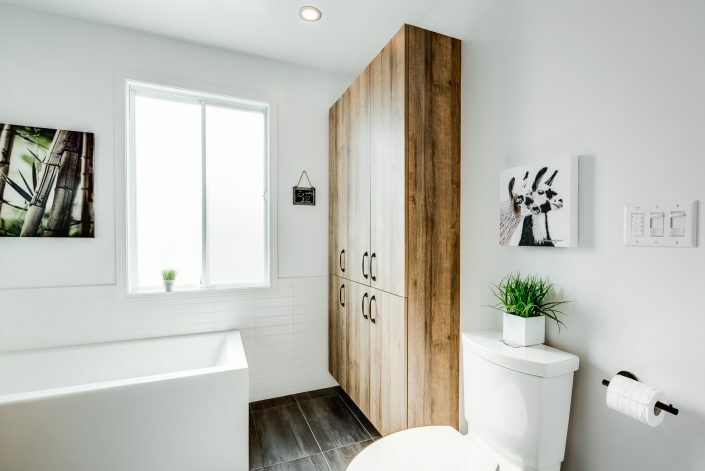 As a general contractor specialized in bathroom renovation, we work on every phase of a renovation project, regardless of its size. 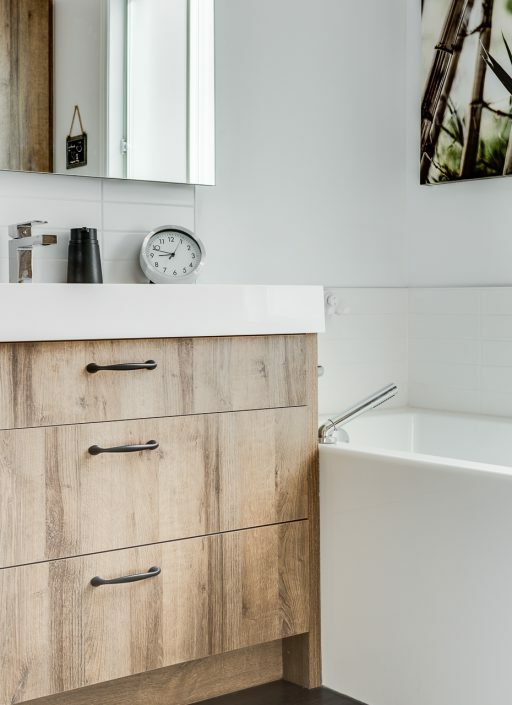 We can’t do it alone: a wide range of subcontractors help us: custom bathroom cabinet makers, designers, architects, painters, plasterers and much more! 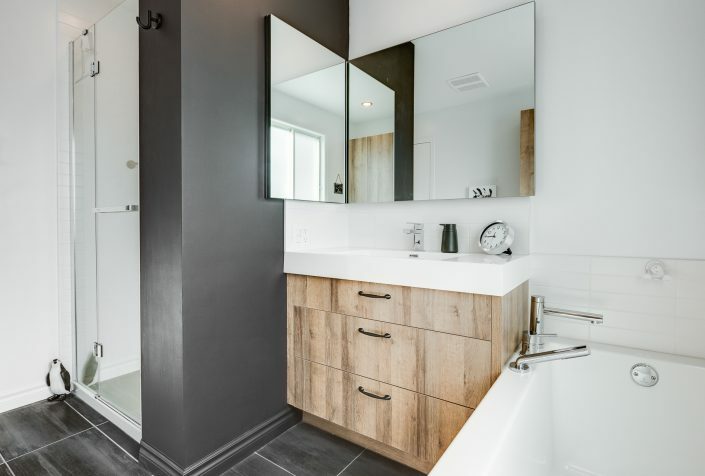 If you would like to have more details about this bathroom renovation project in Longueuil, about our turnkey bathroom renovation services, about our prices, or about our services, we invite you to contact us by email or by phone. Your first consultation is free! Our team will be happy to welcome you and answer your questions.